Cervasi is proud to announce its collaboration with chef, influencer, food and lifestyle blogger and pasta lover, Lauren Lane. 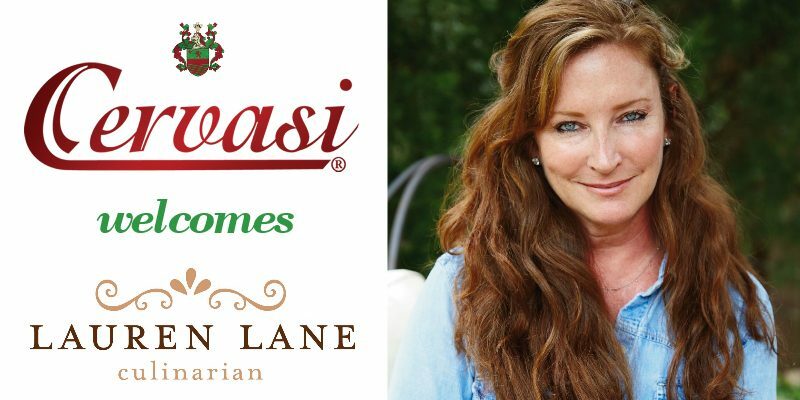 Cervasi is proud to announce its partnership with blogger, influencer, chef Lauren Lane. We aren’t the only ones that know a thing or two about Italian food. It will only take you a short scroll through Lauren Lane’s blog to see that she does, too. That’s why we are thrilled to tell you about our new collaboration with culinarian Lauren! With more than 20 years of experience in cooking, recipe development, food-inspired traveling and culinary instruction, Lauren will be sharing her talents and passion for Italian food with us at Cervasi. Lauren will also be hosting cooking demos and classes, developing recipes and more. She’s an expert on how to make delicious Italian dishes and will provide easy entertaining ideas that will inspire you to gather with friends and family around a Cervasi-inspired table. As a chef instructor at The Culinary Center of Kansas City, Lauren already has an expansive archive of cooking classes under her chef’s hat and an array of future classes coming up. Her Pasta Making Class next month is already sold out if that tells you anything. We are excited about this new partnership and can’t wait to share Lauren’s work with you. You can learn more and follow Lauren’s work by finding her on her blog, Facebook and Instagram — then try out her recipes on Pinterest. While you’re at it, make sure to follow us on Facebook and Pinterest … and did you know we’re also on Instagram? Follow us there, too!